In May of this year it was well reported that a pledge by NSW government for a ‘decade of decentralisation’ would see the movement of approximately 3,000 public service jobs and 100,000 square meters of government office space to Western Sydney. This boat has very much sailed for Newcastle’s consideration in the program. However, it is an interesting example of how we have traditionally shown Sydney and others that we are a business-friendly city with infrastructure and workforce in place. Submissions for consideration from both Western Sydney’s and Newcastle are easily searched and definitely worth taking the time to draw your own conclusion on our ability to market ourselves compared to the standard provided by others. Currently we are sitting with a number of possible opportunities for our region’s future, but no-one is agitating in Sydney or chasing these future opportunities and they are passing us by. It is my belief that the greatest outcomes for our region at the State level will come from an independent representative who understands they are a facilitator, not a socialite. They are the person that can drive the collective or joined-up thinking within our city and afield. The major opportunities in the ‘decade of decentralisation’ are no longer available to us, but this is a good example to understanding how as your Independent member I would navigate this issue for Newcastle. Gather stakeholders from the following sectors – Business, Property, Lifestyle, Digital, Community, Existing Government Agencies, Education, Research, Marketing, Professional Lobbyists, State and Federal Reps and Local Councils. Nominate exactly which public service department we want to lobby to have relocated here. If we have a distinct target, we’ll build a much stronger campaign to achieve our aim. The targeted department must fill a need or enhance the city’s economic diversification strategy. For example – we may target a high data-generating department in order to generate growth in the entrepreneurial clean tech industry. Identify our strengths, weaknesses, opportunities and threats and build actions from these in order to build a strong viable case. For example – we may not have the floor space required, could the Property Council or other stakeholder assist in providing a plan if we were successful in our bid? Finally I would use all industry, government and elected representatives in the region to lobby for the targeted outcome we want. This is a perfect example of why Newcastle needs a true Independent. No matter who is in government I will have a seat at the table and I have the desire and ability to work with every stakeholder. 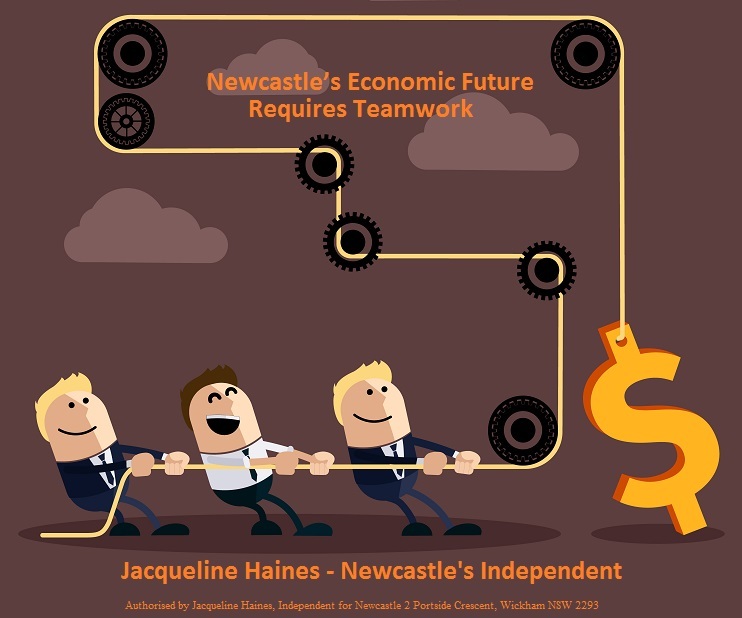 This example is a very basic description of what will be required on a regular basis from your State representative to get Newcastle moving into a diversified future. The execution of such a practice is challenging, this I know because I’m a project manager and navigating stakeholders and defining projects are daily tasks. Simply rocking up to parliament, talking to the floor and asking why Newcastle has not been included is not going to cut it especially if you are a member of the Opposition. We must be strategic in our approach. Employment growth in high-skill occupations depends on it.